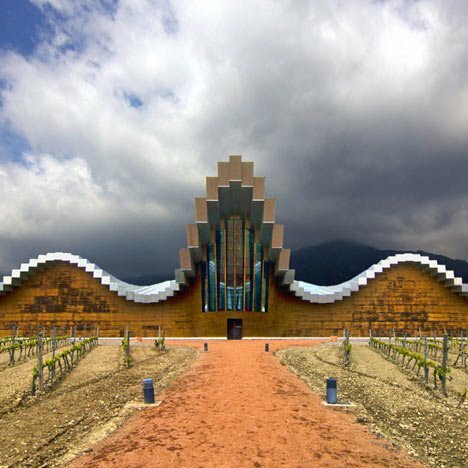 News: the owners of the Santiago Calatrava-designed Ysios winery in Spain have launched legal action against the Spanish architect demanding he pays part of the £1.7 million needed to fix the building's leaky roof. The winery in the rainy La Rioja region has continually let in water since it was completed 12 years ago, according to a writ lodged by Domecq, the winemaker that owns the building. After repeated unsuccessful attempts by the architect's builders to fix the leaks, Domecq now wants Calatrava to put money towards a redesign by a new team of architects and engineers, reports the Guardian. The court action comes less than a year after Calatrava was accused of "bleeding Valencia dry" by allegedly raking in fees of €100 million for the showpiece City of the Arts and Science cultural centre. We previously featured Calatrava's Liège-Guillemins railway station in Belgium and his Fourth Bridge on the Grand Canal in Venice – see all architecture by Santiago Calatrava. Other Spanish wineries to appear on Dezeen include a partially submerged sandstone building and a Corten steel-clad structure by Foster + Partners – see all wineries.